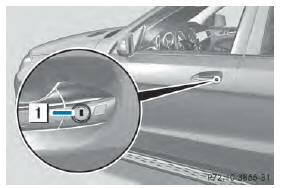 ■ Insert the mechanical key into the lock of the driver's door as far as it will go. 1 To unlock X Turn the mechanical key counter-clockwise to position 1. ■ Turn the mechanical key back and remove it. ■ Insert the mechanical key into the SmartKey.